Featuring powerful dual-core technology to multitask more effectively than ever, the AcerPower F5 is optimized for productivity. An attractive design lets the AcerPower F5 quietly blend into any corporate environment. A cost-effective ATI Radeon Xpress 200 chipset presents a stable and proven platform with potent onboard graphic. Up to 2 GB of DDR2 system memory and generous SATA hard disk options provide abundant room for running programs and storing files. Gigabit Ethernet promotes the use of high-bandwidth applications such as groupware and VoIP. Eight USB 2.0 ports (four in front) enable connection of numerous peripherals and devices. Multiple optical drive options allow you to create and read a variety of CDs and DVDs. Acer Empowering Technology makes common tasks easy, highlighted by the innovative Acer eRecovery Management utility. Tool-less entry, open drive bays and available PCI/PCI Express slots mean upgrades are now simple, painless and fast. 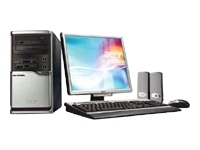 Solid Acer dependability guarantees a lasting and steady product life cycle.